A few Februaries ago, we received an unusual delivery at the office: a giant, ring-shaped cake opulently decorated with both icing and colored sugar (yellow, green, and purple). On the side, there were a few strands of Mardi Gras beads and a tiny plastic baby. A colleague who’d recently moved to New Orleans had generously shared her new tradition with us Californians, and we were delighted to devour it. I’d had a long fascination with the flaky French version, but this southern king cake was also a masterpiece: yeasted and airy, stuffed with a thick pocket of brown sugar, spices, and pecans. Undeniably festive and incredibly sweet, the soft cake was perfect with coffee for an impromptu celebration. Over time, I’ve periodically daydreamed of the cake’s key flavors in new and tasty (and slightly less sweet) embodiments. When I was recently given a bottle of this luscious, boozy tribute to New Orleans coffee, I knew my tasty homage to the king cake was soon to be born. I decided on a toasty pecan cookie, rich with molassesy brown sugar and a scoop of warming nutmeg. Making them wreath-shaped was a no-brainer, and the icing would deliver a lively burst of the liqueur whose depth balanced readily with the mellow flavors in the dough. As a nod to Mardi Gras, I topped many of my cookies with tinted sugar in the three requisite colors like tiny king cakes. But these treats are fabulous any time of year, with nearly any edible decoration (one of my favorites is simply crushed toasted pecans, which this recipe affords). Buttery, boozy and nutty, these crisp cookies are sure to deliver delight, no matter the occasion. In a mixing bowl, beat the butter and sugar until combined. Beat in the egg and vanilla. Sift over the bowl: flour, baking powder, nutmeg and salt. Add the measured ground nuts. Mix until moist crumbs form, then use hands to knead dough gently, then bring into a ball. Re-use scraps of dough and re-flour surfaces as needed, placing cookies on the lined baking sheets as you go, at least 1/2 inch apart. You should end up with about 26-30 cookies. Bake at 375 for about 8 minutes, until edges and bottoms are golden brown. Transfer to cooling racks if available; let cool to room temperature. 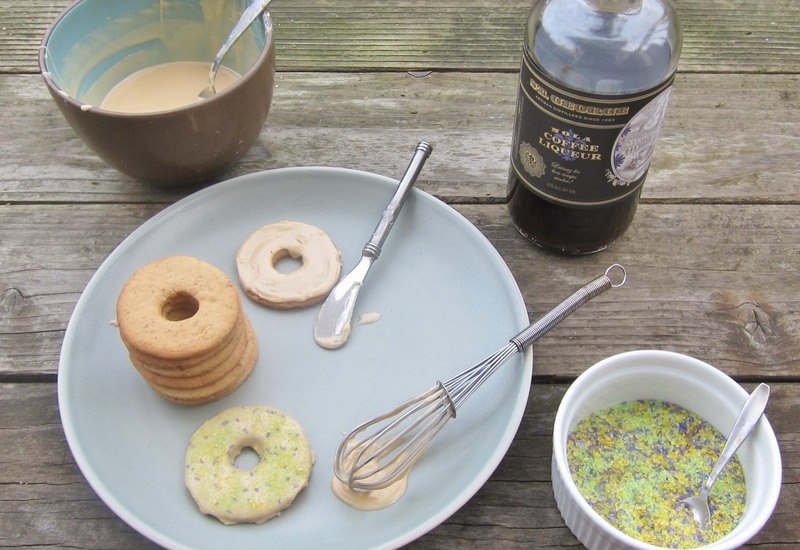 This recipe makes plenty to fully glaze the tops and sides of each cookie using the dunking or spreading methods described below. If you prefer less icing or have smaller quantities of ingredients on hand, you can halve the recipe and use a drizzle/zig-zag method. Whichever method, be sure to cover bowl of glaze when not using (it dries fast), and whisk regularly. 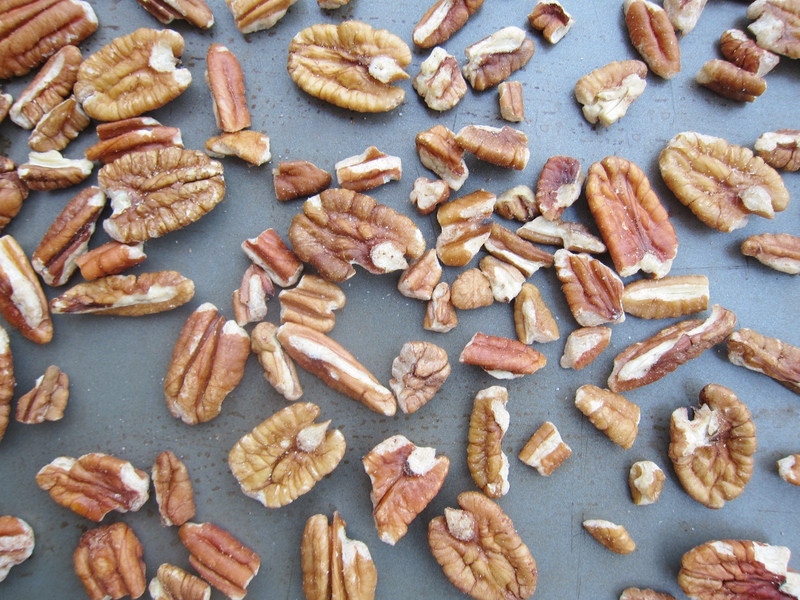 extra crushed pecans from above, and/or sprinkles, sanding sugar, jimmies, etc. If this technique feels too tedious or time consuming, whisk another tablespoon of egg white into the icing, mixing well. Dunk the top of each cookie into glaze, then place on a cooling rack set over a cookie sheet, letting excess drip off. While cookies are still wet, garnish with toppings. Let dry at room temperature before eating or transporting. Store flat in sealed containers at room temperature, using wax paper between layers. *Maybe next time: If you use cookie cutters in any other size than those noted here, be sure to adjust your baking time accordingly, checking cookies early and often for doneness. Bourbon is a great stand in for the coffee liqueur, or if you want to make these alcohol-free, use half vanilla extract and half water in the icing. I skipped a plastic baby or other hidden prize, but it could be fun to bury a safe, edible treasure under the glaze of a cookie for a lucky winner — perhaps a chunk of chocolate or a piece of soft candy pressed into the dough of one of the cookies just before baking. This entry was posted in Baking with Booze, Baking with Tea & Coffee, Cookies & Bars, Sweets, Traditional with a Twist and tagged brown sugar, cookies, February cookies, king cake, mardi gras, new orleans, nutmeg, pecan, pecans, St George Spirits. Bookmark the permalink. These are so lovely looking, and sound delicious! I love the way they are decorated too!